Castration, dismemberment and disembowelment propelled Night of the Demon onto the UK's Video Nasty list and the movie remained banned there until 1993 when a cut version was released by Vipco. The movie is still banned in Norway and Germany and only a cut version exists in the UK. The movie became infamous for a couple of scenes but, as often is the case for movies on the Video Nasty list, the hype and reputation of the movie has escalated it's status to a much higher level than it deserves. Although it is not a terrible movie, it is obviously low budget and the gore and the movie's main protagonist are not very convincing. The story begins with a bandaged up man in a hospital bed surrounded by various experts claiming that he will recover from his injuries but is obviously mentally unstable due to his explanation of how he received his horrific wounds. This is where we flashback to the beginning of the story as the hospitalized anthropologist, Professor Nugent, tells of how he lost all his students in the pursuit of Bigfoot. I'm assuming that the legend of Sasquatch was still quite relevant in 1980 when the movie was made (I would have been too young to remember... honest) as it is quite an uncommon topic for a horror movie. The plot revolves around a group of students and their professor going into the woods to try and uncover evidence that the Yeti does exist. After hearing many rumours from the locals about Bigfoot the team hear of a hermit woman who lives in the "no go" area of the woods who may be able to help them more. They eventually track down the whereabouts of the woman, known to the locals as Crazy Wanda who is said to have had encounters with Bigfoot but has not spoken since so nobody knows the truth behind her story. After practically forcing their way into Crazy Wanda's log cabin and antagonizing her enough it turns out she can speak although she does not seem willing to give too much away. When she does finally spill the beans it turns out that she has had a much closer relationship with the Sasquatch than anyone had suspected and due to this relationship Bigfoot is still very protective about Crazy Wanda and the secrets she keeps in her basement. Soon the students are attacked by the beast, or the Demon as the movie's title suggests, and one by one they meet their bloody demise leaving just the mutilated Professor Nugent to tell his story. The build up to the final battle between anthropologists and Yeti are interjected with many flashbacks as the professor tells stories of various reports of encounters with the elusive creature. These flashback scenes provide a lot of the gore that the movie is reputed for and can sometimes be a shock as they are thrown into a fairly placid part of the movie. One such scene was the a major reason for the original banning of the movie as we flashback to when a motorcyclist stops to relieve himself in the woods and unfortunately pisses on Bigfoot who proceeds to ensure that the motorcyclist will never piss again without the aid of a tube and a bag (well, never piss again full stop actually as I don't think the victim survives his dis-member-ment). Another scene within the finale ensured that the movie would be banned as Bigfoot disembowels a student and whips the rest with the guts! This movie is not the best movie on the Video Nasty List but is a tribute to what can be done with no budget and an eye for gore. 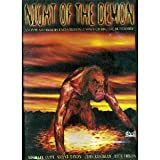 James C. Wasson, the director of Night of the Demon, must be proud that he could cause such controversy with no money, no name actors and cheesy effects. A must for splatter-addicts, gore hounds and B-Movie enthusiasts but maybe not a good choice for the more sophisticated movie buff.